Wayne Craven is The Henry Francis du Pont Winterthur Professor of Art History, Emeritus, at the University of Delaware. Marble Halls is a companion to Craven's Gilded Mansions (2009). Craven (emer., Univ. of Delaware) focuses this new work on civic buildings, using as examples state capitals, train stations, libraries, and museums. He also includes an entire chapter on Gilded Age gentleman’s clubs, though such buildings were typically accessible only to members. Craven begins as nearly all studies of Beaux arts classicism do, with a chapter on the 1893 World’s Columbian Exposition in Chicago. In each subsequent chapter, he looks at the architects and artists who created the best-known works of the period, and provides economic and political context relevant to the creation of each building. With a few notable exceptions (the 1893 Exposition, the Boston Public Library), the examples Craven uses are located in New York City and Washington, DC. 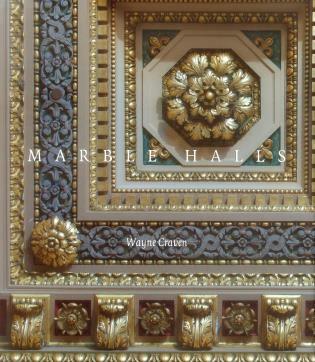 Marble Halls is written for general not academic readers and is well illustrated with images of classical American architecture and the interior decoration, polished marble, painting, and sculpture that defined the sumptuous Gilded Age. Marble Halls is about the great civic buildings that were designed in the style of Beaux-Arts classicism during the Gilded Age (1865–1918) and about the City Beautiful movement that was intended to improve the setting for the buildings and the urban environment for the people. The Industrial Revolution, which arrived belatedly in the United States, provided the wealth required for grand architecture, and the classical Beaux-style was imported from Paris to serve as a veneer to a society that saw itself as brash and culturally unrefined. Major buildings, from New York City to San Francisco and from St. Paul, MN, to Jacksonville, FL, are discussed as the creations of architects such as McKim, Mead & White, Richard Morris Hunt, and Cass Gilbert with exteriors enhanced by the sculptures of Daniel Chester French and Augustus Saint-Gaudens. But the interiors, too, received rich ornamentation as America saw the rise of its first real school of mural painters whose work was often complemented by the art of the mosaic-maker and the stained-glass window-maker; the Gilded Age was the era that saw the formation of a national association of mural painters and a national sculpture society, as well as national, state and local agencies and commissions to oversee the quality of work in civic buildings. All collaborated to produce the glorious grandeur that Americans believed reflected their proper place as a new power that arose on the world stage, in politics, economics, and military adventurism. Federal buildings, state houses, court houses, train stations, libraries and art museums are discussed as contributors to the City Beautiful movement and to the assertive personality of the new American.